The Opera browser becomes more compelling by the month. Opera, which seems determined to pack generations worth of improvements into a few short months, boasts yet another reason for you to switch browsers: a “low-power mode” that the company promises will extend your laptop’s battery life by up to 50 percent. Like other, recent releases, the new feature will first appear as part of a developer edition of the Opera 39 browser for both Mac and Windows PCs. This follows a native ad blocker that Opera first featured as part of a developer edition in March, and which has since become mainstream. 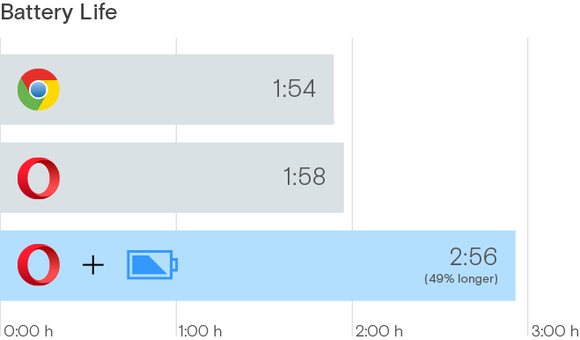 That feature appears to help the new low-power mode achieve best results. Opera says that in its internal testing of the new build it gained an additional hour of battery life while running the browser on a Core i7-based Dell XPS 13 with 16GB of RAM, powered by a 64-bit version of Windows 10. Ad blocking was enabled, the company said. Opera’s battery life claims. The company used the Selenium automated browser tool to test 11 popular websites: adding a tab, scrolling down, then letting it sit for a minute. The cycle repeated itself until the notebook ran out of battery. Why this matters: Suddenly, browsers matter again. 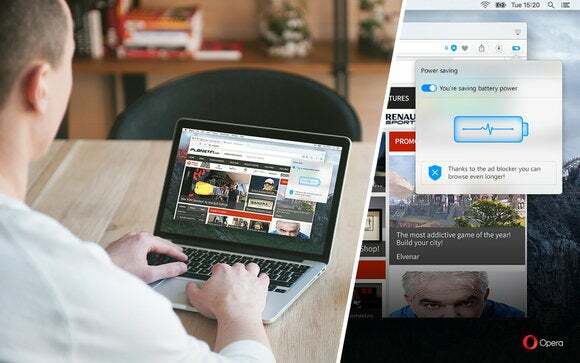 Opera has garnered a lot of attention with its recent deluge of improvements; in addition to the native ad blocker, Opera rallied privacy-minded users with a native, unlimited VPN built right into the browser. Microsoft, for its part, is tying its Cortana digital assistant to its Edge browser, and reminding users that plugin-like features, such as coupon finding, are built right in. And then there’s Vivaldi, the new Chromium browser by former Opera employees. A large battery icon signals the low-power mode. You can also switch this on and off in the Settings menu. To preserve power in the new low-power mode, Opera says that parts of the browser’s code have been simplified, and its animated themes optimized. Additional improvements include reducing activity in background tabs, adapting page-redrawing frequency, and tuning video-playback parameters, according to the company. “In this version, we are also testing a smarter way of managing memory, which ensures that constantly opened tabs like Gmail and Facebook will be much more responsive,” Opera said in a statement. According to Opera, the new power-saving mode will automatically be displayed when you unplug your laptop, in much the same way your OS detects when your laptop’s unplugged. (You’ll see a large battery icon next to the search and address field, if you have any doubts.) Low-power mode apparently won’t be enabled, however, until you toggle it on. As your battery power runs low, Opera may pop up a message advising you to enable the feature. Opera didn’t say exactly when the low-power mode would enter the mainstream, stable version of its browser. Still, it took about two months for ad blocking to move from the developer edition to being generally available, so we might see it by July.